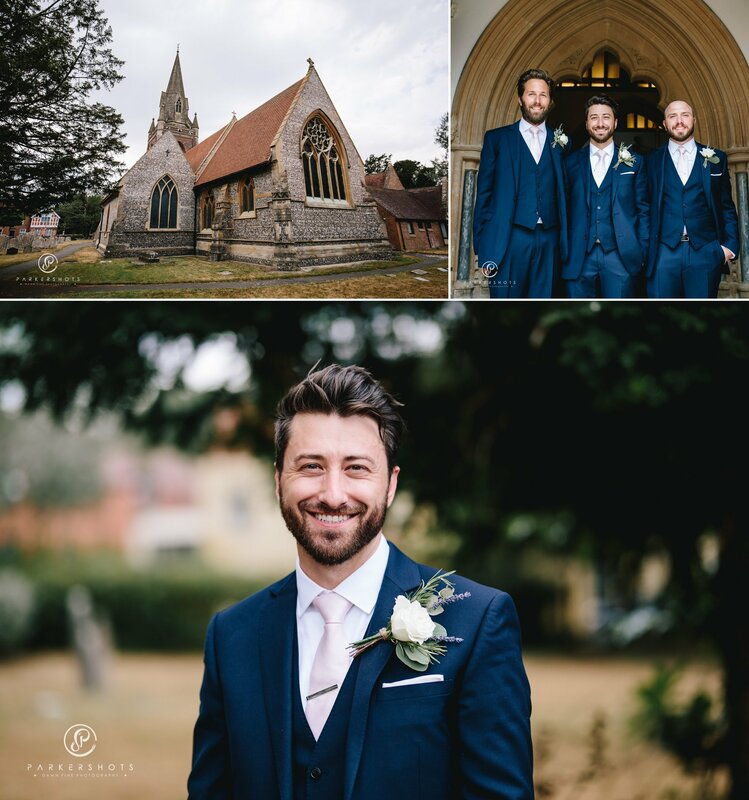 I felt an instant connection to Helen and James when we first met, so was extremely pleased when they decided to book me to photograph their wedding. 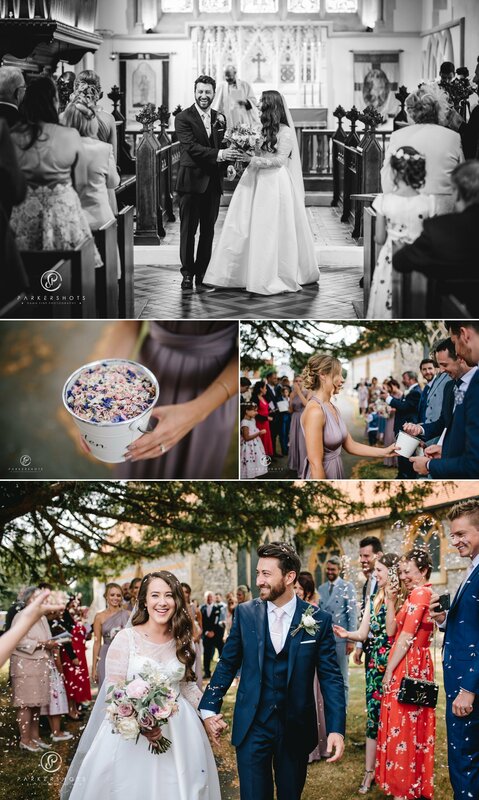 Their venue looked amazing online and was even better when actually there. 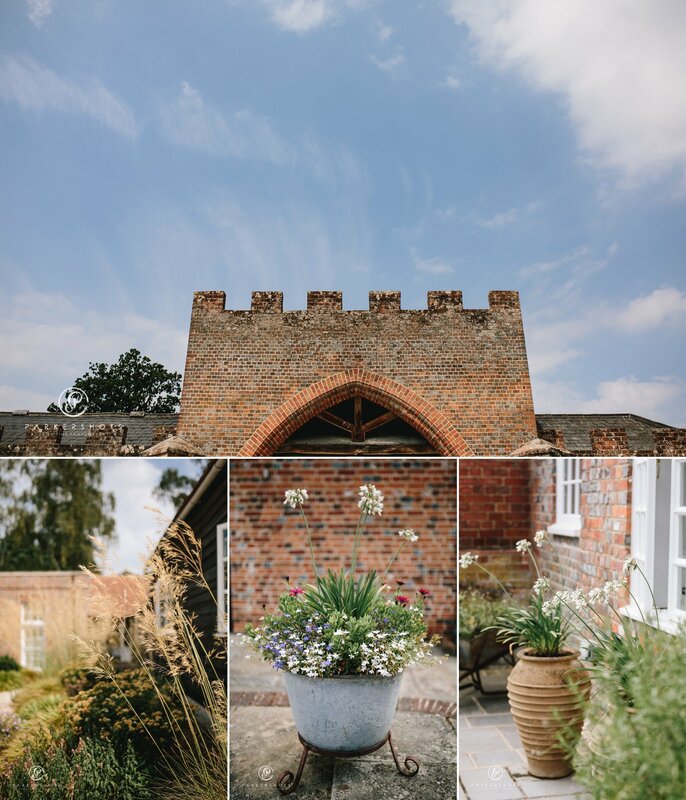 There are so many beautiful features to it, and cool areas that I knew it would be great fun to photograph a wedding at. We all hope for good weather on our wedding day & I don’t think any of us would have expected this summer to be as hot as it was. Wow – there were some extremely hot days. When I drove up to the area of the wedding the day before, the thermometer of the car showed the temperature to be 45 degrees celsius (in the sun on a motorway) when passing Heathrow. That’s the hottest I’ve ever seen it, and as it turns out, was the hottest day of the year. Thankfully on the day of the wedding, there was a beautiful layer of clouds in the sky bringing the temperature down to a more comfortable level, although it was still hot enough to warrant the bridesmaids crowding around a fan during the morning prep. 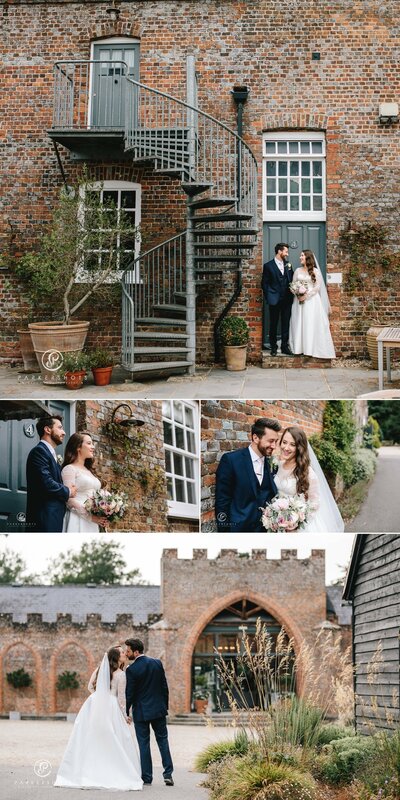 I loved Helen and James’ England / French wedding and styling choices. 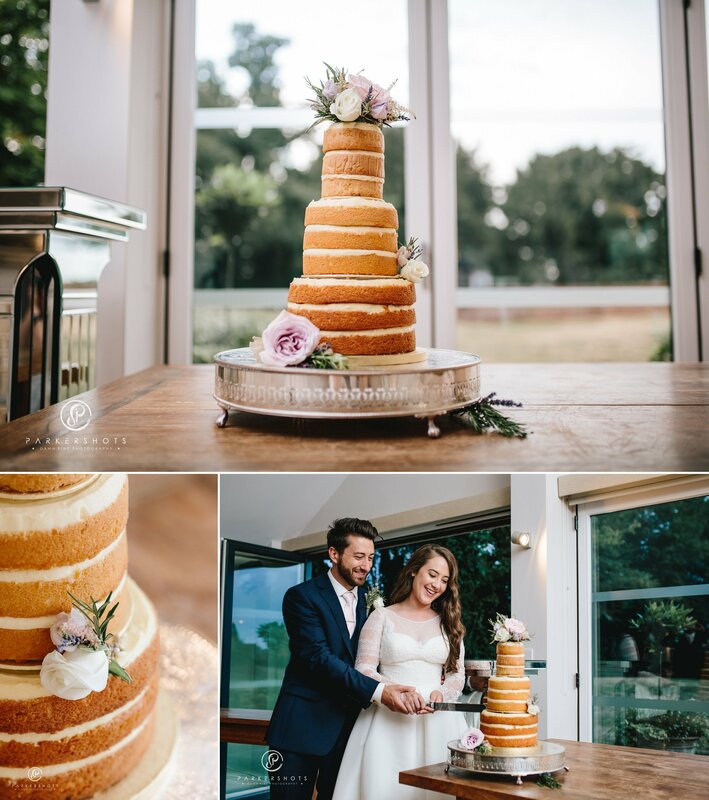 Helen looked beautiful and elegant in her Jesus Peiro dress and James looked suave in his Moss Bros suit. 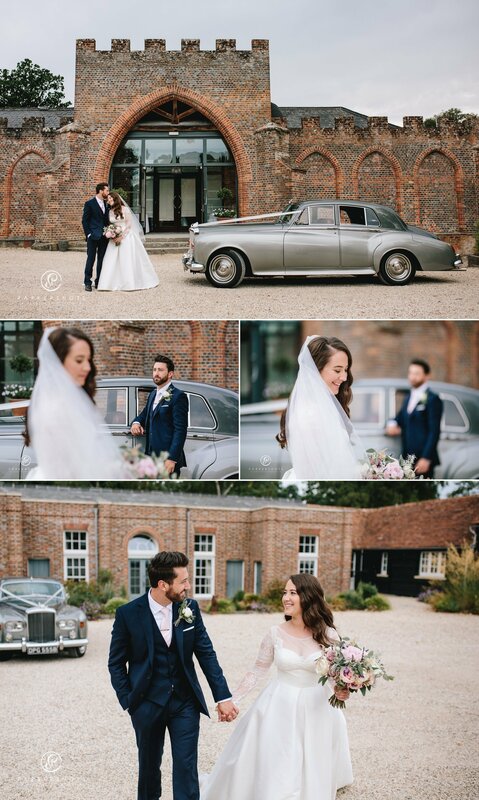 Their choice of Bentley for wedding car worked perfectly and looked amazing cruising along the drive and pulling up to the venue. 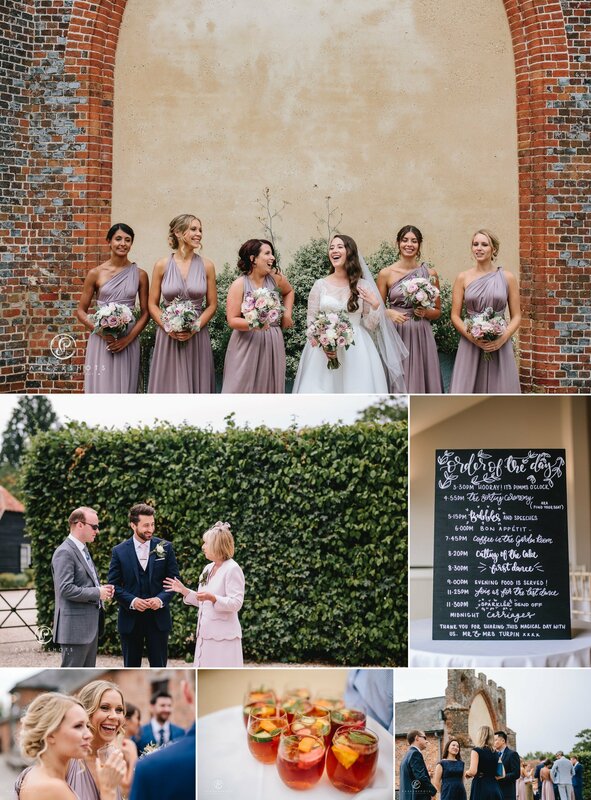 It was a pleasure capturing their whole day, and especially walking around the grounds with them for the portraits, but a special mention has to go to a couple of other moments during the day. 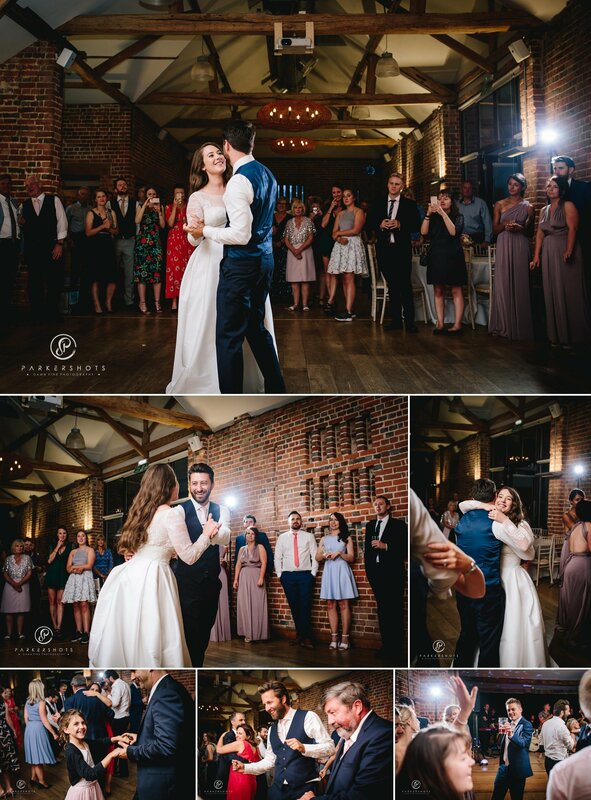 The father of bride’s speech was particularly memorable, and ended with a surprise performance of the Spice Girls (seen in the images below), and I loved seeing the father of the groom break out the ‘floss dance’ in the evening – he’s got some great moves! 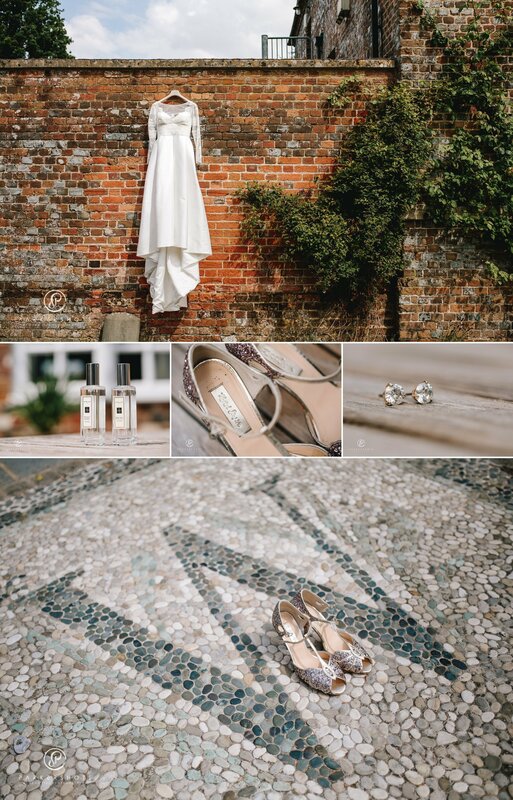 “We got married in the church where Helen’s parents had had their wedding, which added a special touch to the day. We chose to let the church speak for itself when it came to décor and lots of our guests commented on what a pretty church it was, which was lovely. 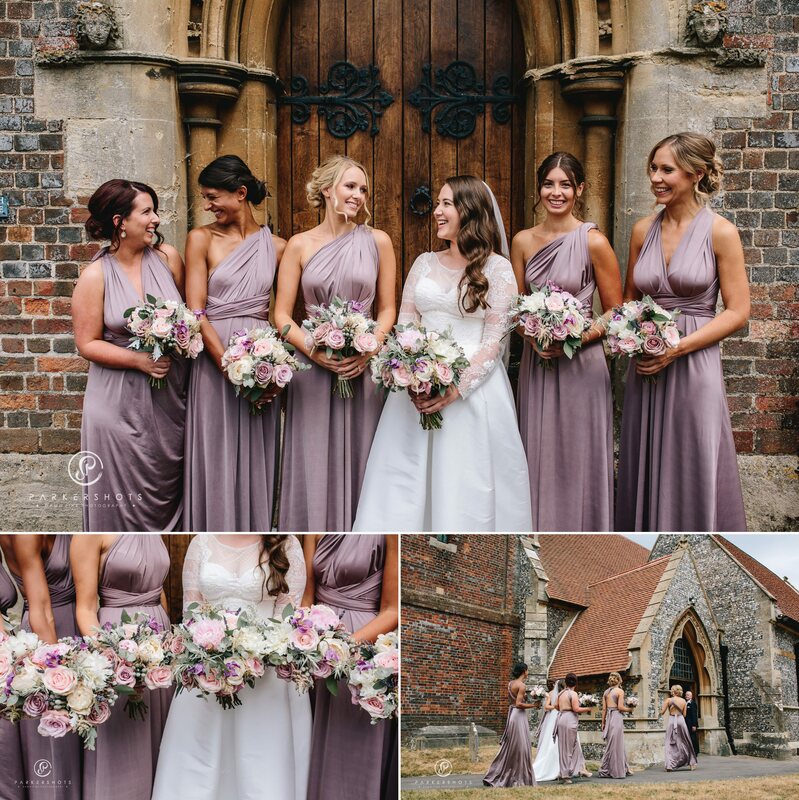 “We wanted the look of our day to reflect the natural elements/outside space, using natural materials such as wooden accessories and keeping our colour palette fresh with white, pink, purple and grey-green tones. We also wanted to include a French twist to reflect James’s heritage. Our incredibly talented friend designed all of our stationery and we decided early on to use a sprig of French lavender as our emblem. We also included lavender in the boys’ button holes and the bride’s/bridemaids’ bouquets, all of which were tied with brown hessian wraps. We spent 18 months sourcing French wine crates to use as centrepieces on the tables, which our florist Tarnia Williams filled with beautiful flowers. 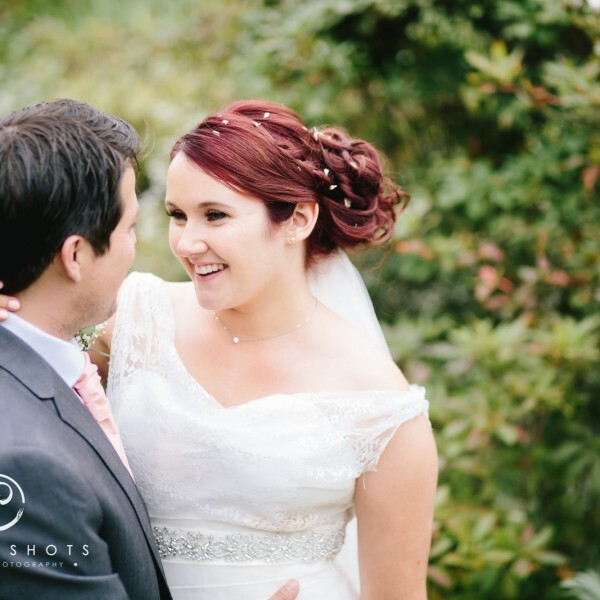 “I had a clear idea about the kind of dress I was after but finding it was another thing! 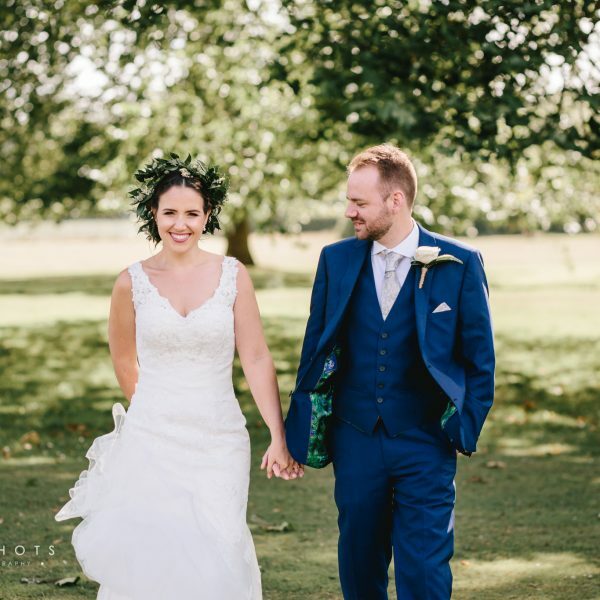 In the end, The Pantiles Bride in Tunbridge Wells delivered and my dress had all the elements I was looking for; a full structured skirt in a plain fabric, full-length delicate lace sleeves and, most importantly, pockets! 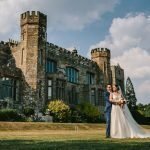 “We did some serious research when it came to photographers, but Nick was the only one we met with and we knew straight away that we wanted him to photograph our wedding. 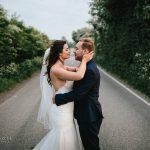 Nick manages to tell a story by capturing the journey of the couple throughout each part of their day, and each photograph is so well thought out in terms of lighting and composition.